Camping in an apple orchard farm?! Apple Orchard Farm & Camp is where you need to head if you’re craving a mix of luxury, scenic views, and a whole lot of apples! Set adjacent to Bapsa river and amidst the Himalayas, Apple Orchard Farm & Camp is a whole new take on camping. 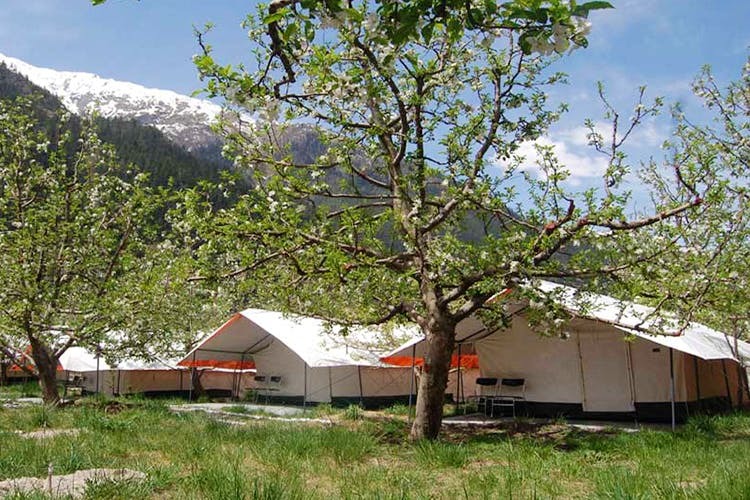 This campsite in Sangla Valley is a pure delight to the senses. A cavalry of 10 Swiss tents make up the camp and a larger common tent is your dining headquarters. Every tented abode is furnished with beds, a seating area, and a bathroom. Activities like hiking, trekking, rock climbing, and trout fishing can be easily arranged upon request, although we doubt you’re gonna want to move even an inch from your picturesque spot. This eco-friendly camping luxury is what getaways are made for. Take stunning photos, breathe in the fresh air, and take a break from the fast-paced city life. Apple orchards and walnut trees, lush green landscape and snow laden mountains in view, luxury tents and exciting activities? Talk about vacay goals! They haven't mentioned their pricing on the website – it would be great to get a better idea without having to go to third party booking portals. The best seasons to go here are autumn and fall, but by the looks of it, we wouldn't mind going here at any time of the year.